Called rosé in France, rosado in Spain, rosato in Italy, and sometimes even blush in contemporary colloquial lexicon, pink wines in all their variances are wonderfully paired for the hot summer season. Rosé’s sweetness can certainly vary, from bone-dry, old-world Provençal releases to the sweet strawberry flavours of Californian White Zinfandel. So too can the flavours of rosé vary, but they can commonly include palates with strawberry, raspberry, grapefruit, redcurrant, almond, and fresh cut hay. 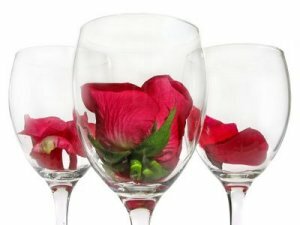 Rosé wines are made from traditionally red varietals in a number of different ways. The vin gris method for rosé production is generally considered to produce the highest quality wine. With this method, the grape juice is obtained by stacking the harvest in a vertical tank, and letting the natural weight of the grapes crush themselves, during which a very pale pink colour is imparted, most often seen in rosé from Provence. In the next gradation, pressé, the grapes are pressed in the tank until the desired colour is attained. Another common method, limited maceration, involves macerating the grapes, skins and stems for a shorter period of time than normal. This is a process where the tannin, colour and flavour of the grapes impart themselves into the vinum mustum, literally “young wine,” often called must. The skin-contact phenolics give the wine its distinctive rosy colour, and the maceration period can range from several hours to several days before the wine is separated from the must and fermented. The longer the period of contact, the deeper and more tannic the wine, from pale pink to salmon to full bodied bright red. Finally, the saignée method (French for “bleeding”), is quite literally a wine “bled off” from red wine must, used in Bordeaux and Burgundy, most often as an afterthought to the primary red production. Bleeding has occasionally criticised by other producers as “not true rosés,” similar to decolouration, stripping the colours (and often the flavours) off of a fully finished red wine with charcoal filters. Rosé can come from anywhere in the world, and like any wine, rosé flavour characteristics come from the varietal. Many Provençal rosés, often considered the best in the world, make use of Grenache or Mourvèdre blended with Cinsaut to impart dry, fruity and floral characteristics. Similar results can be found with Pinot Noir, and Sangiovese. Syrah and Cabernet-based rose wines, while still dry, can impart more savoury and meaty characteristics, and finally the strongest grapes like Portuguese Touriga Nacional or American Zinfandel create juicier and sweet rosés respectively. Most rosés are a blend of multiple varietals. 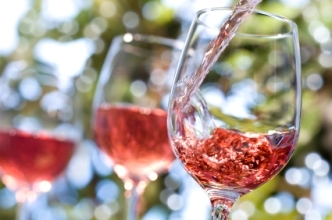 For still rosé wines, it is important to drink the wine fresh. No cellaring required! These summer sippers should be consumed within 1-3 years. Luckily, this also makes rosé among the most affordable styles of wine on the shelf, with a wide array of options available for $25 and under. Pairing rosé is also remarkably simple. Rosé is versatile for simple sipping, summer salads, fish, and even barbecued chicken or pork because it strikes a medium flavour profile between red and white wines and occupies a broad spectrum of strength and flavours based on the varietal. In particular, the rosés of Provence pairs beautifully with garlic-filled Mediterranean food, which by no accident is common to the region. Like most whites, rosé wines are best served slightly chilled, but beware or over-chilling the wines and reducing the flavours you’ll be able to taste! Last but not least, don’t forget bubbles! Sparking Rosé is found year round, can include white varietals in the blend, and can be aged spectacularly. The next time you come in to deVine, be sure to ask about your rosé options, and enjoy your summer!